The best thing is that no one would mistake your artistic luggage for theirs, on the conveyor belt at baggage pickup, at the airport! I eventually would love to get iron on patches from places I travel and put them on my carry on so it looks like trunks from back in the day when people would have stickers from their travels labeled all over. Snuggled up in a warm fleece blanket on a cold day. Dreaming about being in WDW! Seems I cant go a week without having at least one dream of being somewhere around property. I am the human equivalent of Tamatoa. Love anything real and shiny! Finding vintage Disney items while shopping at yardsales. Awww look at those cuties! 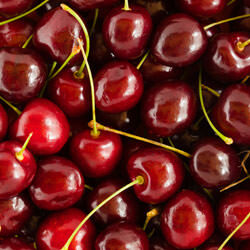 This is the season for Washington state cherries -- yum! Watching the progress of all the projects being built on WDW property. Walking outside on crisp fall mornings, and enjoying the colorful autumn leaves.